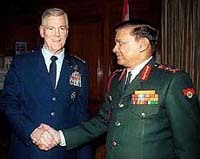 Claiming that his country did not have a large military presence in the region, Gen Richard B. Myers, Chairman of the Joint Chiefs of Staff of the USA, today ruled out playing any restraining role in the present stand-off between India and Pakistan on the border and stressed that the two countries had to work out their problems bilaterally. “We don’t have a large military presence but as far as the problems between India and Pakistan are concerned, it is for the two countries to work them out,” he said while talking to mediapersons after concluding his two-day visit to India. General Myers, who had intensive and fruitful discussions with Indian leaders and defence officials, was asked if the US presence in the region could act as a restraining factor if there was belligerence from India or Pakistan in their current stand-off. He, however, stated that the USA definitely was a restraining factor as far as Afghanistan was concerned. General Myers met External Affairs Minister Jaswant Singh, National Security Adviser Brajesh Mishra, Defence Secretary Yogendra Narain, and Gen S. Padmanabhan, Chairman of the Chiefs of Staff Committee. He was also briefed by senior defence officials on India’s security concerns against the backdrop of the build-up on the Indo-Pak border. 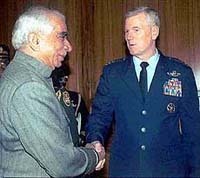 Asked if he had discussed with his Indian interlocutors any specific steps with regard to the situation in the region, General Myers said, “We discussed it in general but the emphasis during my discussions was on the military relationship between the two countries, which has started blossoming.” The two countries were cooperating in the global war against terrorism, he added. India is likely to get the urgently needed weapon locating radars (WLR) from the USA soon with a high-level military team arriving here on Wednesday to negotiate the deal. India and the USA having already set up a Security Cooperation Group (SCG) earlier this month to focus on the export licence and narrow down the areas of interest for the Ministry of Defence (MoD), the WLRs are the first item that are being negotiated by New Delhi. According to sources in the MoD the visit of this high-level military team from the USA to negotiate the deal for AN/TPQ-37 WLRs, would be the first to visit India to negotiate on the purchase of military equipment. The team is being led by Major-General Bruce Scott, Commanding General, US Army Security Assistance Command. The agreement, which would greatly benefit the Indian Army, would also be the first major government-to-government purchase of military equipment from the USA. Agreements pertaining to other types of equipment are expected to follow in the coming few months. India had, earlier in the month, submitted a 20-item wish list to the USA and the WLRs were on the top, especially as the Indian Army posted along the Line of Control (LoC) and the international border (IB) has been on a disadvantage on this front. Pakistan already possessing the WLRs has been gaining from India and the supply of the radars would neutralise that advantage. The absence of WLRs was also felt greatly by the Indian Army during the Kargil conflict with Pakistan in 1999. While Pakistan possessed the earlier version of the AN/TPQ, India had the inventory of British Cymbeline mortar detecting radars, which were not very helpful as the system is useful for detecting shells from a high angle. However, the latest radars which India would get have the detection, tracking and location finding abilities where gun’s position is determined even before the missile hits the target. MoD sources said that the high-level US team is expected to carry out negotiations, including that for the price, with the Indian counterparts over the next few days after their arrival on Wednesday. The team is expected to also carry a formal proposal in this regard. “We are certainly alarmed by India’s relentless pursuit of acquisition of defence equipment which is far beyond its genuine defence needs and creates unnecessary arms race and tension particularly when we have to put all resources to eliminate poverty in the subcontinent,” Pakistan Foreign Office spokesman Aziz Ahmed Khan told reporters here. Military-to-military relations between India and the USA are set to reach a new high in the coming months. The two countries’ top military brass will be engaged in talks to explore newer areas of defence cooperation, decide on mutually convenient dates for holding joint exercises, discuss ways to combat terrorism together and even go for research, development and production of weapon systems jointly. The Joint Technical Group (JTG) between the two countries is scheduled to meet in Washington early next month wherein the two sides are going to decide on the list of weapon systems which they mean to take up for joint research, development and production, well placed sources here said today. Significantly, Washington does not have this level of military-to-military cooperation with Islamabad though the Bush administration has been trying to do a balancing act and trying to keep the Pakistanis happy. So far, the Americans’ defence cooperation with Pakistan is confined to joint exercises which in itself means nothing much, the sources said. The JTG is part of the larger Defence Policy Group (DPG) which was set up in 1995 when the then US Defence Secretary William Perry visited India. Since then the DPG had held three meetings when the Indo-US relations were hit by Pokhran-II nuclear tests by India. The DPG was revived last year and another meeting was held here in December last. The next meeting of the DPG will now be held in Washington in May this year. It is taking place within five months of the previous meeting because a huge backlog of important issues has piled up and these issues need to be cleared fast. It is understood that the Americans are very keen on sharing military intelligence with India as unlike Pakistan, the credibility of Indian agencies is on a much higher footing. The Pakistani military intelligence has been perforated by fundamentalists and, therefore, is not completely reliable. The Americans’ interest in building closer military-to-military ties with India stems from their short-term and long-term security and strategic assessments. The Americans are aware Islamist radicals of different hues, including the Al-Qaida gang, are bound to target American interests worldwide and, therefore, a healthier and bigger military intelligence umbrella is desirable. Interestingly, the Indo-US DPG is going to be preceded and followed by a top-level meeting of the two countries’ military officials in Washington, called “net assessment”, which will exchange assessment of security and strategic issues. While the American side at the Net Assessment will be led by Mr Andrew Marshal, the Indian side will be led by General Pankaj Joshi, Chief of Integrated Defence Staff. The first meeting of Net Assessment starts in April, less than a month ahead of the DPG meeting. Incidentally, the USA does not have a DPG with Pakistan.